I think I had a wrong bottle or something. There was a lot of head. To much carbonation in the beginning. After a while when the carbonation was fewer the taste of the beer was really watery and light. An abrupt finish and not a very special taste. I should try this one again cause I think it can score better than this experience. Purchased in Japan, poured from a 330 ml brown bottle with gold label into a tulip glass. Look: The liquid is transparent amber-gold with lively carbonation. The head is thick, medium bubbles, about an inch deep, very slightly off white color, and does not settle quickly. Thick foam sticks to the sides of the glass in hefty lacing. Minutes later and the head is still thick and fluffy. Smell: Hoppy bitterness fills the nose with some overt skunkiness. Burrying my face in the glass reveals some spiciness, cloves and nutmeg as well as mellow banana. Some yeast present as well, in a warm baked bread sort of way. You really have to search for the complex scents here though. Taste: Huh, bitter hops, a light maltiness and a buttery flavor are ever present. Theres some mellow banana character here as well, but I cant shake the feeling that there is some off skunky character in the mix as well. Feel: A bit thin but not unpleasant. High amount of carbonation makes for a bubbly-sloshy mouthfeel. The bitterness scours the tongue a slight bit and is overall pretty refreshing. Overall: A pretty solid beer, theres a few defects present, but overall a flavorful and light brew. I had this brew on tap at a little bar in Gent. Served from a wide-mouthed goblet, the brew has a modest head and a bit of a haze. It's color is a mix between dark-yellow and orange, with relatively low carbonation. The aroma has a nice mix of esters and spice, backed by a pale malt smell. Not much in the way of hops in the nose. The taste is a little sweet, with a hint of aromatic spices. There's a little pepper and lemon as well. It's not overly complex, which makes it drinkable. Medium mouthfeel, but probably a bit light for most beers in it's class. This is a solidly good beer, but uninteresting as a Belgian. very yeasty aroma.nice bubbles, lace, orange body.spicy yeasty taste,tad of fruit moderate in taste, carbonation not too much, all works towars climax of harshness.Malt has some offset. Combined with alcohol is drying.Thin mouthfeel. Acceptable blond, have had better. I vaguely remember when Tongerlo Blond first entered the market & I was very curious to try it, so I bought this bottle, setting it aside with every intent of quickly reviewing it. Somehow, it became a part of the Bottle Backlog here at Chez Woody, patiently awaiting my attention until now. 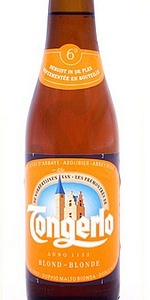 From the bottle: "Secondary fermentation on the bottle"; "Abdijbier der Norbertijnen - Biere D'Abbaye Des Premontres - Cerveza De Abadia - Abbey Beer - Birra D'Abbazia"; "Tongerlo Blond is an officially certified Belgian Abbey beer, brewed with the approval of the Norbertines of Tongerlo. This copper-coloured beer, with secondary fermentation in the bottle, has a honey aroma, a full and smooth flavor and a gently evolving aftertaste. "; "Biere Belge D'Abbaye Reconnue - Certified Belgian Abbey Beer". The bottling date read "060913 08:39", so with a nearly-four year old bottle, I really could not do anything more than Pop! the cap & conduct a very gentle pour. Once decanted, it began to puff up of its own accord, forming a finger of dense, foamy, eggshell-white head with great retention. Color was Deep Amber/Light Copper to Copper (SRM = > 13, < 17) with NE-quality clarity. Nose smelled strongly of honey (good truth in advertising!) with a biscuity maltiness. Once more, I was reminded of my late-maternal grandmother's honey-drizzled biscuits, especially in the summer. Mouthfeel was medium, but with a good bit of carbonation. The taste was VERY honey-like, but at the same time, also very sweet. The ex-Old Lady was/is an apiarist & meaderist & this beer reminded me of a young mead. It was certainly within the guidelines for the style & in keeping with the brewery's description, but dang, it was cloyingly sweet! I was thinking of honeysuckle at one point. Finish was sweet, leaving me satiated. 'Nuff said. Hazy medium yellow, white head that showed some lace. Very yeasty aroma, buttery, with a bit of fruit. Mild maltiness with a sweet finish. Not really much flavour, but the yeast sure shines through. A bit harsh in the finish, but not overpowering. Light body, fairly high carbonation. Overall it's okay, but once was enough. Very basic straightforward simple belgian beer. Not a lot going on, but there's not meant to be a lot happening here. Not a bad beer at all. Poured with a nice foamy frothy off white head that diminished to a thin cover after a bit and good lace. Color is a clear amber. Aroma is a mild belgian tripel. Flavor's the same. Carbonation and body are good. Finish is easy. Session beer. Pours a slightly hazy but bright golden, medium white head forms, sticks around, laces nicely. Smell is sweet honey, citrus, yeast and slight sourness. Taste is malty, with grains, honey, citrus, orange peel, clean bitter finish. Mouthfeel is medium to low bodied, with medium carbonation. Not a bad blond. Appearance: Served up on tap in a Tongerlo chalice at an unnamed cafe in Framerie, Belgium. Golden orange color with an off white head. It looks darker than many blonde Belgian beers. Smell: Light malty scent with citrus, hay, and sand. Taste: Big malty taste to start off. A bit over carbonated so it is rather spritzy. Some citrus, sesame, and spiciness. It strikes me as rather plain and uninteresting. All of the flavors are very light and fast. No flavor stands out or impreses me. Mouthfeel: Mostly smooth and clean. There is a bit of harshness on the back of my palate. It may be from the overcarbonation. It's refreshing on a hot afternoon. Drinkability: A decent soft Belgian taste, not terrible for sure, but not memorable either. A wonderfull poorout was the first thing I noticed about this beer witch name Dubbel Blond sounds strange; aren't they all Dubbel brown/dark? Anyway head is more then just OK staying long and layers of foam stick at the sides of the glas staying even longer. This with a clear and bronzegolden beercolor make presance more then just good. Nose is lots of yeastspice remembering litle of champagne and some apricotesters also there. Further nice maltsmell so all together a good nose. Taste is litle empty but clean a having a good maltyness before ending only litle bitter. Mouthfeel is plesant though and drinkability is good and this brew floats down easy. Subtle and certainly fuller with character than your typical stalwart lager, this lightly spiced and honeyish ale reminds me of a crisper and cleanly flavored Leffe Blonde- perfectly fitting the slight damp evening at Galgenhuisje Cafe in Gent. The pour from draft reveals a chalice of bright golden elixir that's aptly carbonated for a beer brimming with spritzy bubbles that congregate in a creamy and slightly rocky, cotton white head. Perfumy aromas of corriander and ripe oranges hint towards witbiers, but pull back when it comes to wheat. Instead, a the full scent of pilsner malts gives a cracker-like snap to the scent and provides a firm underpinning to the fruity esters and yeasty spice. Full pilsner flavors deliver a semi-sweet taste of fresh baked breads, lightly kilned grain, and softer powdered sugar that gives a firm and pleasant introduction to the tongue. A middle palate full of juicy candy-coated fruits, soft and supple spice of curacao, coriander, white pepper, ripe oranges, and appricots. The malty-dry taste finishes with a mild herbal and minty hop bitterness that balances the beer but never adopts undue attention. Medium-light on the palate, the zesty carbonation pulls the malt sugars from the tongue and ushers in a peppery dry, mildly alcoholic warm mid palate that extends into finish. Light acids play on the mouth and gives a well-suited refreshment to the beer. With its understated demeanor, Tongerlo blonde ale provides the crisp malt taste of classy German lagers, but the characterful yeast of peppery spice and fruity esters layer on more character with dryness and herbal essence. 330 ml. bottle. Gloden to orange colour, with a big creamy white head that sticks to the class and lasts for a good while. Smell of bubblegum, cloves, tropical fruits. Medium body, light palate. Taste is just the same as smell: bubblegum, clove, tropical fruits, spices. Coming in a 330ml slim brown bottle, at 6.5%abv. ; BB 07/08/14, served chilled in a stemmed goblet. Appearance: pours a very clear, dark golden colour coming with a thin off-white foamy head and rather light but constant carbonation. Smell: light-coloured prune-dominated aroma, edged with very pale malts, sweet lemons or Goldings’ aroma, and a weird old-rusty note. Besides these elements, even after a very good swirl is there very little to come through. Not nice and very simplistic. Taste: quite fizzy, the taste is bitter-sweet and lightly estery & acidic-fruity, featuring light-coloured (lager) malts, dried grassiness, lemon-ness, prunes, overripe fruitiness (types unknown), as well as a semi-dry and chewy-spicy palate of hop bitterness to linger in the finish, along with a belated entry of alc. warmth. Mouthfeel & Overall: really very normal, mundane, and slightly watery at the end of each sip, this sufficiently refreshing, albeit quite fizzy, medium-bodied pale beer doesn’t show a properly complex flavour profile, or maybe being simplistic and its almost Pilsner-like quality is what it meant to achieve. Alas, this is not my cup of tea. On-tap in Ghent. A sweet and simple blonde. Not as thick as Leffe, but clean and pleasant - and good enough in Belgium. There's no hint of the adjuncts or sugar that were likely used, instead you get a simple, somewhat spicy Belgian blonde ale that would be a good gateway beer to the uninitiated. Poured into a chalice, color is dark copper/amber, head is huge and bright white. Bottle did open and gush lightly, but the best by date just past. Smell is light spice, pepper, then crackers, biscuit, light toast. A sweet flavor presents as well, subtle caramel/toffee like note. Taste is light, pleasant, a bit sweet but also a little dry; I'm assuming this beer is truly fits its name than the style identified - it tastes like a dubbel blond blend, with maybe a bit more dubbel proportion-wise. Mouthfeel is dryer than the aroma and flavor might lead to believe, tongue dries out on the top with sweeter flavors on the sides of the mouth. Overall, this beer is very drinkable, and has pleasant flavors even if it is approaching expiration. Brown 33cl bottle, best before Nov 2007, drank March 2007. Poured into a Straffe Hendrik bowl glass, without any sediment leaving the bottle, the head suffered because of my slow pour, but it still produced a nice foaming white/off white crown on the beer. the body was an orange, tangarine colour, slight haze which made it look cloudy. Aroma of yeasts and citrus fruits, mostly lemon or maybe limes. The label claims it has a honey aroma, I couldn't detect it until I read it was there. Sourness at first, fizzy too, the yeast aroma carries on into the taste, no honey flavour! The label also mentions maize as an ingrediant, this may well appear in the mouthfeel, aftertaste, which is fairly weak really. Not the best blonde I've had, but I would have another of these, I won't hunt for one, but drink another, I would. Had this as part of a sampler at a Brussels restaurant for lunch. I love that each "sample" was at least 8 oz. A-Pours a dense 3 fingers of white head. Color is golden with just a slight haziness. S-Slightly fruity, barley malt is definitely there. T-Really more than I expected from the aroma. Full flavored indeed. Heavy malty upfront and in the finish. Slightly meaty/savory...odd but tasty. M-Excellent. Very crisp and clean. D-Very high-this is a well balanced beer that finishes very nicely inviting the next drink. O-A blonde with more flavor than most but still finishes nicely, best of both worlds. I would like to have this one again. L: Poured from a bottle to a tulip glass. Had a copper color and a clear texture. There was a half inch of foamy, fairly long-lasting head. Very good lacing. S: A very average aroma of malt, Belgian yeast, light fruit, and a bready quality. T: Tasted of a little bit of light fruit (a little bit of banana, perhaps?) some light citrus notes (orange), a lot of malt, fair amount of Belgian yeast, candi sugar, and light spices (coriander, pepper). Definitely an uneven flavor, with a bit too much malt overpowering everything else. Still, not too bad. F: A highly carbonated beer with a lively, if somewhat slick and syrupy, finish. Medium-bodied. O: This beer probably isn't as bad as the overall score suggests, but it has its flaws. Still worth a look though.